Making supper tonight was fun and different. We were reluctant to open the refrigerator because we didn’t know when we’d be getting power again, so we concentrated on food we could get from the cupboards. 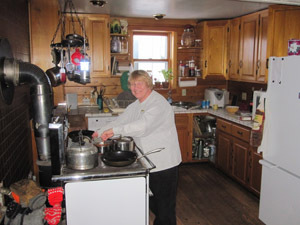 I had tried to let the kitchen stove fire go out because the hot water was getting too hot (a water jacket in the firebox of the woodstove feeds the hot water tank upstairs. The only way to keep the water in the tank below boiling is to use it, which we couldn’t do with the power out.) We poked the fire up just enough to cook supper. You can see Alice slaving away at the stove with our emergency LCD lantern hanging above the stove. Supper was yummy and different enough from what we usually do to be special. Note that the flash of the camera illuminated things much more than they actually were. This entry was posted on Friday, February 18th, 2011 at 9:19 pm and is filed under Uncategorized. You can follow any responses to this entry through the RSS 2.0 feed. You can leave a response, or trackback from your own site. Was the fridge going warm really a concern? My parents near Gwinn were electricity-less too. There house really is more of a summer home, and not very well insulated. Their geothermal heat pump doesn’t run with no electricity, and the house got down to ~40 degrees before heat was restored. An exploration of backup heat alternatives is underway.